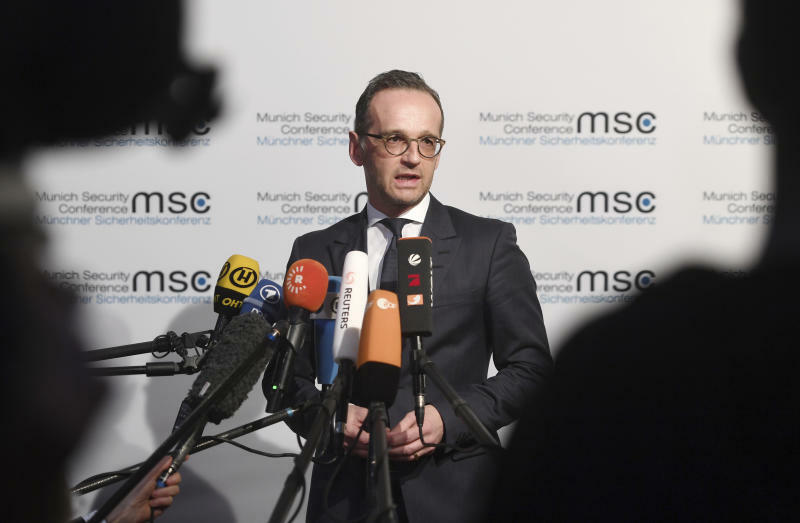 MUNICH — Germany's foreign minister on Friday slammed U.S. President Donald Trump's protectionist trade measures as creating a "lose-lose" situation and defended Europe's attempts to keep a nuclear deal with Iran alive after the unilateral American withdrawal. Heiko Maas fired back after harsh criticism from U.S. Vice President Mike Pence of some of Washington's closest European allies. Maas told a conference of world leaders and top diplomats and defense officials that Germany, Britain, France and the European Union as a whole were committed to preserving the 2015 deal meant to prevent Iran from obtaining a bomb. "Without it, one thing is clear, the region would be no safer but instead a step closer to an open confrontation, with all of the implications that would have on Europe's own security," he said. The comments at the Munich Security Conference came the day after Pence, at a conference in Warsaw, accused the three European NATO allies of trying to "break" American sanctions on Iran and called on them to pull out from the nuclear deal. "The time has come for our European partners to withdraw from the Iran nuclear deal and join with us as we bring the economic and diplomatic pressure necessary to give the Iranian people, the region and the world the peace security and freedom they deserve," Pence said. The U.S. withdrew unilaterally last year from the deal offering Iran incentives in exchange for limiting its nuclear capability and re-imposed tough sanctions, leaving the Europeans, as well as China and Russia, scrambling to try and keep it alive. EU foreign policy chief Federica Mogherini also defended the deal, saying that the bloc would do whatever possible to keep it alive. "We believe it is fundamental and crucial to our security, and a fundamental pillar for the nuclear non-proliferation architecture globally," she said. In Paris, France's foreign affairs ministry issued a statement in response to Pence's call, saying that the country was standing by its commitment to the implementation of the Iran deal. Iran wasn't represented in Warsaw, but Foreign Minister Javad Zarif is in Munich for the weekend meetings. He told NBC's "Today" show in comments broadcast Friday that even if the U.S. wanted to renegotiate the nuclear deal, he wouldn't trust the Trump administration to honor any new agreement. "Why should we negotiate?" he said. "Why should we trust President Trump that he would abide by his own signature?" The U.S. and Europe have been at odds over a host of other issues, including American criticism that Germany and other allies are shirking their NATO obligations by not spending enough on defense budgets — something Pence is expected to again emphasize in a speech Saturday in Munich — and European concerns over new tariffs levied by Washington as well as its decision to pull out of the Paris climate accord. Initially, Europeans took a wait-and-see approach to see how things would play out with Trump, but have been recently taking a more aggressive stance in pushing back. Maas said that Germany has "no interest in a division of the West," but he said the U.S. needed to work with its partners to seek multilateral solutions to international issues, like the rising power and influence of China. He singled out Trump's tariffs on steel, saying they had cost jobs in the U.S., raised the cost of steel and are threatening jobs in Europe. "For me, it's a classic case of lose-lose," he said. He rejected the suggestion that Germany wasn't doing its part internationally, noting several military deployments but also other engagements. "We actively promote much closer cooperation in all policy areas, from security, trade and digital to climate and the environment," he said. "But I also say very clearly, for us security is not measured solely in increasing defense budgets." Geir Moulson in Berlin, and Sylvie Corbet in Paris, contributed to this report.